What a great page and that must have been fun, yay Jay! I like the way you showed the Chili. was that Jay’s? And great use of embellishments and the film frames. I like the way you placed your title, too! I really like the layout of this page with the big picture of chili drawing your focus. You did a great job with the title and embellishments too. It looks like so much fun and yummy too! What a great page! I love the photos (especially happy winner #3) and the shades of white to go with that winning bowl of chili. Looks like lots of fun! Congrats! 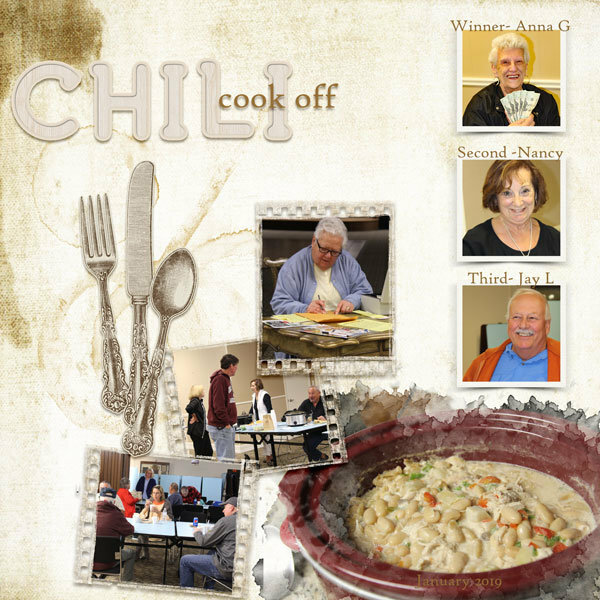 Love the photos and the chili looks wonderful! Cute frames, too. Super page! I have that kit too, I like the way you used it. Great photos tell the story.